The Hawker 400XP is a light jet that seats up to 7 passengers and has a range of 1,500 nautical miles. The Hawker 400XP has an enclosed lavatory and a partial galley. The luxurious cabin of the Hawker 400XP is the perfect private jet to conduct meetings or simply relax. Cessna’s update to the popular Citation II is the fuel-efficient Citation Bravo. It has a fantastic range compared to other light jets and excellent performance on short runways, giving passengers choices of thousands of airports. Typical flights include New York to Miami, London to Malaga, and Aspen to Los Angeles. Contact Priority One to charter your Citation Bravo today. Quite a few reasons, in fact. As its name suggests, the Encore+ has added even more of what operators loved about the original. Pilot operation has been simplified thanks to a new Rockwell Collins Pro Line 21 flight deck. And the original Encore’s 17-foot-plus cabin (5.18 m), one of the longest in its class, has been newly designed. The Citation CJ2 climbs more quickly, cruises faster and ranges farther than its predecessors. Yet, remarkably, it uses less fuel. The CJ2 also delivers enhanced passenger and pilot comfort and more advanced avionics. It is exhilarating to fly, but the CJ2 is also the sensible, efficient business jet for you and your company. The Citation CJ3 charter jet has always been so intuitive to operate that even veteran aviators are often reminded of why they fell in love with flying in the first place. The Cessna Citation Ultra private jet is a remarkable business jet that can comfortably accommodate 8 passengers and fly them over 500 mph for more than 2,100 miles. The maximum operating altitude is 13.700 m (45.000 ft). The Citation V has a fine blend of cabin comfort, performance, and reliability. It is a good choice for short trips. The deciding factor for most clients when comparing Citation air charter to other options is often the comfort of the cabin. The Citation V’s cabin is 17.4 feet long, 4.8 feet wide, and 4.8 feet high. Compare these numbers to the Hawker 400XP’s cabin dimensions of 15.6 x 4.8 x 4.9 feet, or the Citation Bravo’s dimensions of 15.8 x 4.7 x 4.8 feet – the difference in length is significant. The engineers of the Citation V took advantage of the extra cabin space and installed extra-wide seats that recline 60 degrees and rotate a full 360 degrees. The Dassault Family creates jets with high standards of engineering, structural quality, and technological advancement. Although Dassault’s models have evolved and improved over time, the Falcon 10, a light, twin-turbo fan business jet, remains popular, and for good reason. With Falcon jet charter, you are allowed fantastic performance on short runways without sacrificing speed or range. 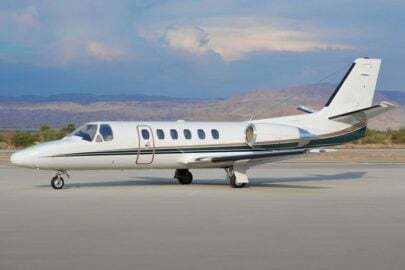 The Lear 31 is, arguably the ultimate realization of the original Lear charter jets dating back to the model 23 of 1963. Essentially combining the fuselage and engines of the model 35 and 36 with the “Longhorn” wing of the 28, 29 and 55 models, results in performance which is equalled by few aircraft. Normal cruise altitudes range from 12,500 to 14,900 meters and the aircraft’s maximum cruise altitude of 15,500 meters is a distinction shared by only a handful of civil aircraft. The Lear 35 is has a relatively long range for a private jet. Lear jet charter flyers can cruise at speeds as high as 451 ktas, or 424 ktas with four passengers. Fuel consumption is excellent; burning only 177 pounds of fuel per hour.